The Sanctuary Blue Heron Condos: Don't miss your chance to own this 3 bedroom 2 bathroom gem! This home comes with an attached 2 car garage, tile in the main areas, plantation shutters, and carpet in the bedrooms. The cathedral ceilings and split floor plan offer a spacious feeling. Enjoy the privacy of your backyard that overlooks a preserve view while enjoying your morning coffee or entertaining guests. The newer A/C was installed November 2018. The Owner is currently installing a new washer, dryer, and dishwasher in addition to repainting the whole home and adding granite counter tops in the kitchen. Blue Heron offers a community pool, tennis courts, and an exercise room. The lawn maintenance is included with the HOA as well as cable, internet, and water. Approximately 7 miles to Downtown Naples, 1.5 miles to Berkshire Commons, and 1.9 miles to the I-75 ramp on Collier Blvd., this home sits in the center of it all! MAKE YOUR OFFER TODAY!! MOTIVATED SELLER!! The Sanctuary Blue Heron Condos: An absolute perfect home for year round living or as a winter resident! This is a wonderfully maintained split two bedroom with a den, that could easily be used a third bedroom with two full bathrooms. There are wood floors through out the home with tile in the bathrooms and laundry room, plus a two car attached garage. In the master bedroom you will find two walk in closets, the master bath features dual vanities, walk-in shower and large soaking tub. The living area is spacious, open and allows for a dining area, with a breakfast bar. The kitchen has a separate casual dining area, that features new cabinets, with stainless steel appliance. All windows & doors are impact glass, so no need to worry about shutters or not being prepared for a summer storm. The pool, spa, tennis courts, fitness room are just a short walk from your front door. Publix is a short drive in a plaza that features restaurants, shops, banks a fuel marts. Come see today why The Sanctuary in Blue Heron is one of Naples best secrets. The Sanctuary Blue Heron Condos: LOWEST PRICE UNIT WITH Incredible LAKE View!!!! GREAT VACATION PROPERTY, INVESTMENT or PRIMARY HOME! Built in 2005! 3 bedroom 2 bath Villa w/2 car Garage. Screened in Lanai to relax & enjoy your morning coffee! The Sanctuary at BLUE HERON community offers secured entry, & community amenities that include pool, community room, exercise room & tennis courts. EXCELLENT LOACTION! Minutes to downtown 5th Ave, Upscale Shopping & Dining, Entertainment/Community Theater, Art Festivals, Framers Markets, Boating, Fishing, Galleries, Starbucks, Publix, 75 freeway & award winning white sandy Naples Beach! Don't miss this one to OWN YOUR OWN PIECE OF SW FLORIDA's "PARADISE COAST"! Needs some TLC! & Updates. Come make it your Own! Blue Heron Condos: Immaculate condo is Turnkey and all ready for new owners! This Beautiful 3 bedroom 2 bath luxury condo has been taken extremely well care of. It features a stunning sought after SW view of the lake in this desirable community including a clubhouse. The 3rd bedroom is currently set up as a den but can be used as a third bedroom, has a closest. New large tile on the diagonal, new A/C system, new patio furniture, new couch, and a new dishwasher. Spacious and bright, this living and dining are provides a wonderful space to entertain guests while enjoying the view! Relax by the community pool in this quiet neighborhood. Blue Heron is conveniently located to shopping, restaurants, I 75 and is just a short drive to Naples’ award winning beaches! This property has been maintained meticulously and is a must see! Blue Heron Condos: C.15091 - Impeccably maintained first floor 3-bedroom condo with SW lake view. Enjoy this end unit with extra sunlight reminding you why you wanted to live in Florida. Impact windows and sliding glass doors for peace of mind. Many updates, including granite counter tops, electric roll down storm shutter on lanai. A/C unit was replaced in 2014. Fantastic location off Radio Rd. Blue Heron has a active social schedule and many amenities available. Come see this one today! Blue Heron Condos: Prepare to be mesmerized by this stunning lake and 2 fountain view! This immaculate 3 bedroom condo is open and spacious and features beautiful new wood flooring, new paint, newer AC, hurricane impact windows and a screened lanai where you can sit and watch the sunset over the lake! Blue Heron has low HOA fees and offers a community pool and clubhouse. It is located just minutes to Naples' award winning white sand beaches and is close to shopping, restaurants and 75. This is the opportunity you've been waiting for to live the Florida lifestyle you deserve! Blue Heron Condos: Don't miss the opportunity to purchase a 2 plus den (or 3 bedroom) condo at the Blue Heron. Ground floor and fully furnished convenience. Ready to move in by April 1st. Community with low fees and great location. 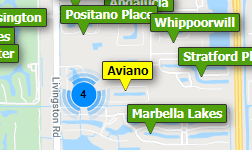 A newer condo at such affordable price will be difficult to find in Naples. A must see! Schedule a showing today. Blue Heron Condos: GREAT VALUE for a 2006 built condominium unit that lives wide and with spacious bedrooms. This 2/2 unit is priced well, features impact glass windows and doors, red oak wood floors throughout the living areas and bedrooms, real wood plantation shutters throughout the residence, and is a convenient first-floor location where you do not have to use elevators. Newer granite countertops installed in the kitchen including a bar-height seating area near the kitchen pass through opening, updated lighting fixtures in the dining room and kitchen, and is neat as a pin. Sunny morning exposure provides a peaceful place to sit on your screened lanai to drink your morning cup of coffee, while listening to birds chirp in the wooded preserve. Blue Heron is conveniently located within 10-15 minutes from downtown 5th Avenue S. where you can enjoy fine dining, galleries, shops, and beaches on every street. Do not miss this opportunity. Amenities include pin entry gate in the evening, a clubhouse next to the swimming pool, and lots of lakes and sidewalks to enjoy the neighborhood. Blue Heron Condos: This Beautiful Condo Is located In The Great Community Of Blue Heron. This 2 Bedrooms 2 Bath Condo Is On The Third Floor Which Offers A Common Elevator And Features An Open Floor Plan, Tray Ceilings, Tile Floors In The Dining/Living Room, New Laminate Floors in Bedrooms, Home Features No Carpet, AC Replaced 2018 and Water Heater With Expansion Tank installed in 2014. Blue Heron Community Offers A Gated Entry, Community Pool and Community Room. EXCELLENT LOCATION! Minutes To Downtown 5th Ave, 3rd Street Dining And Award Winning White Sandy Naples Beach! Call For A Showing Today. Blue Heron Condos: C.15751 Open floor plan, tray ceiling, diagonal tile throughout. New air conditioner. Tenants are in place through March 2020. Blue Heron Condos: 2 Bedroom/2 Bathroom unit, tenant occupied, being sold subject to the lease....the perfect investment for your future. Tenants in place and may consider staying on after lease expires in 4/2020. Preserve view with privacy. New ac unit, new hot water heater, new garbage disposal and ready for new owners. Tile on the diagonal. Priced to sell! Blue Heron Condos: Welcome to Blue Heron Naples. This freshly painted 2 bed 2 bath condo is great wether its used seasonly or if you plan to be a year round resident here in Naples. This condo has a pristine view from the lanai, overlooking the fountain with eastern exposure. It's also only steps away from the clubhouse and pool. There is covered carport parking, as well as a common elevator for all residents. This is a well maintained community with pool, gated entrance and very social clubhouse. Blue Heron is conveniently located less than 15 minutes to downtown Naples and 10 minutes to I-75 that will take you anywhere you need to go in Naples and Beyond! Need professional assistance selling your property at Blue Heron Naples? Find out how an Area Specialist can help to generate more property exposure in order to get the most money for your investment in the least amount of time.